We look back at the past community event in an interview with Flufferpope. Read it here! 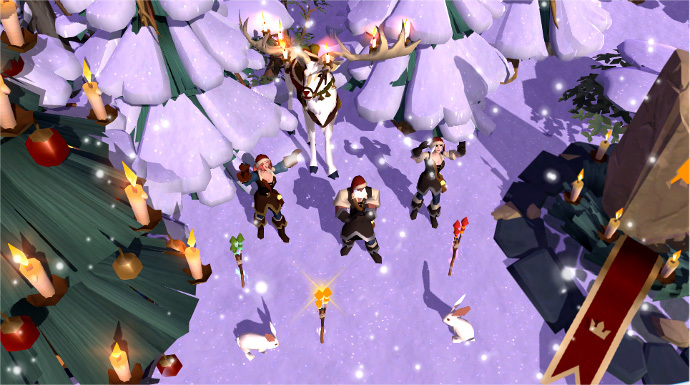 On December 10, all three of Uncle Frost’s Helpers were successfully rescued by more than 100 players who took part in the Hide and Seek Holiday Event. After the event had ended, I met with FlufferPope, one of the organizers of the event. We talked about the planning, organization, and execution of their first community-run project. Urza: How many people were involved in the event’s organization and when did you start working on it? FlufferPope: We were a group of five who planned and organized the event. We came together in early November but the actual planning for this event started at the end of November once we knew what event we wanted to do. Urza: What was your job? FlufferPope: I lead the planning, organization, and running of the event. As I call it: I sit back and tell people what to do. Lol! But no, really, I mostly managed people. I made sure we got the next Helper in place at the right time, I made sure announcements went out quickly enough during the event and I directed the people recording the event. Urza: Why did you decide to do a hide and seek event? FlufferPope: We wanted to do an event in the open world that would bring in a lot of PvP. When we were tossing around a lot of event ideas, one of us jokingly said to do a holiday event. We thought it would be a cool story to say some Helpers who knew chest permissions got kidnapped, and the community had to find them. What it really was providing was a way to get players into one section of the world, and have them roaming, looking for a shared objective. Urza: What difficulties did you encounter in the planning, organization and execution of the event? FlufferPope: Getting people into a single area of the world is harder in the Outlands due to the lack of fast travel. People basing in Baile Braigh would have a much harder time participating in this event than people near the event location. We tried to announce at least one hour ahead that the event was going to start near Dauntensea to compensate. We toyed with different options and we might have worked up something that will remove this problem entirely for our upcoming events. Urza: How was the atmosphere? Tell us something about the killing, talking, and the time after the event! FlufferPope: Before the event started, everyone seemed to sit down and camp the city in Dauntensea. As soon as the event kicked off, everyone fanned out, combing the nearby zones for the Helpers. There was a lot of smack talk, but I did notice something; Everyone was positive about the event itself and even commonly known trolls lay down their work and started being really cool with the GMs that showed up for the event. After the event was over, there was some good residual PvP as well! Urza: With PvP being a core feature of this event, who showed up? FlufferPope: We had a lot of different zergs running around. Most seemed to be the patchwork of different guilds. Codex, Honor n Glory, and EoS all showed up in number. It appeared that there were some Red Army guys, Grief, Conflict, Vendetta, and many other guilds mixed into patchwork groups. I was disappointed KDS was a no-show, as I expected them to give EoS a run for their money. While I didn’t see much of the PvP first hand because I was running the event, I heard a lot of great stories of a lot of side fights. Urza: What do you think about the event looking at it as a whole? Are there any things that could be improved for the future? FlufferPope: I think we could have posted clearer rules, but overall I think the event actually went nearly perfectly. The only snag we had was at the very end. Mahlboro from Honor n Glory achieved the full time needed to win, but his entire group was killed almost instantly after the timer ran out. We could have just left the stuff in the chest, but it looked like EoS had a firm hold on the area. So we restarted the timer, 8 more minutes, and told Mahlboro if his group could retake the position before the timer ran out, the prize was instantly his. Otherwise it would go to EoS, which it did in the end. Urza: Did you receive any feedback after the event? Will you do more events in the future? If yes, any sneak peek for us? FlufferPope: Yes and yes! We got a lot of private messages telling us how much people loved the event. After the event, GM Joe went around gathering feedback in cities and got an all-round positive response. We hope to do at least one event a month. For the next event: It will also be PvP-focused, but not as zerg-oriented as this one. We will have a more leveled playing field! Urza: Is there anything you want to be included? FlufferPope: Yes, definitely. I want to make it clear that no developer time was spent on this event. It was organized by the community team, and was not taking time away from making the game. It seems to be the biggest complaint I have heard anywhere about the event, and I just want people to know these are community-organized events. By players in conjunction with Sandbox Interactive community team, for players. We just want people to have fun! Did you take part in the event? Let us know in the comments below and on our forums! Want to know what the Helpers thought of their rescuers or you want to share stories about your epic battles as well? This is the place to go!